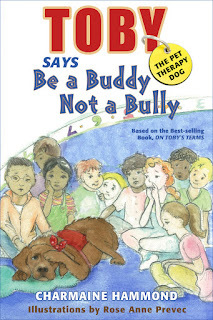 Toby the Pet Therapy Dog Says Be a Buddy NOT a Bully is the second book in the Toby the Pet Therapy Dog children's series. The book will be released June 1, 2013. When Toby the dog steps into the path of another dog who bullies him, and shreds his beloved stuffed teddy-bear toy, we see the hurt feelings it creates. This book teaches children about the importance of kindness, respect, acceptance, and being considerate of others, including pets. The book also has classroom discussion questions at the end of the book, as well as activities for children. Imagine what it would be like if you suddenly understood how to communicate more effectively with your dog. If you better understood behavior and training techniques. What difference would it make to both your lives if you learned more about how to keep your dog healthier and happier? Learn all this and so much more! I'll be sharing stories about how animals have impacted my life, and in Toby's case, became a teacher for me...teaching lessons of life, love and purpose. My interview is May 21, 2013. Team Toby- PAWsitively improving lives by teaching kindness, acceptance and respect! Have you puppy trained your kids? Can we Pleaseeeeeeee get a puppy? Have you had that question posed in your family yet? I am certain my parents heard that question repeatedly when we were children. Our dreams were answered... I remember our first dog, Duchess. She was a beautiful mixed breed dog who loved us girls unconditionally. We learned how to care for a dog, how to travel with a dog, how to be consistent with the "dog" rules and most importantly, the gifts of unconditional love that Duchess gave us every day. When I met the CritterKin pack, I knew this would be a walk in the dog park! I am delighted to share CritterKin with you. CritterKin is creating an app for children, and has partnered with the humane educator at the SPCA of Wake County North Carolina "to make sure that kids aren't just entertained, they're educated. 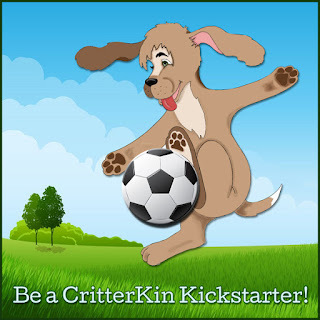 Kids will be excited about owning a puppy, and the CritterKin app will ensure that they're ready." Good Treat/Bad Treat - Why dogs shouldn't eat chocolate! Zap the Fleas – What are common pests that can harm your dog? Play - How do dogs play? What kind of play do dogs need? What lessons do you hope your children will learn? What lessons has your family learned from a pet? Will you join the pack? Together we CAN make a difference and create forever homes for animals.